The influence of your color and texture selection is impactful considering the banquet tables and chairs occupy a considerable percentage of your event space. 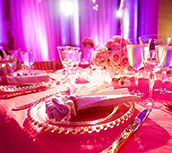 Allow Eventions Event Designs to set the stage and the table with creative options in table linen. We provide linen rental for functions of all sizes, budgets, and occasions. Check out our blog and Facebook for updated package specials. From the glitz of sequins and the glitter of iridescent, to the rustic ruffle of burlap, our selections will harmonize your event theme. With color, you can create a whimsical tablescape with orange and pink; romance with red and black; clean lines with gray, white, and yellow; or a monochromatic environment with blue. Our wide array of linens in various textiles help our customers to ignite their creativity. Most importantly, have fun with color combinations for your table linens which will make your event memorable. Event Essentials Collection: If you're looking for a way to create a luxurious atmosphere without the expensive cost of high-end linens, this affordable collection offers many colors in polyester, satin, bengaline, and organza. Price point is under $15 per banquet table (120” round). Event Effects Collection: Outfit your event with this collection which features textured, printed, and solid colored linens in spandex, taffeta, dupioni, chiffon, pintuck, damask, brocade, lace, tapestry, metallic, velvet, chintzes, velour and prints, and novelties. Price point starts at $18 per banquet table (120” round). Event Elements Collection: It is essential for event professionals to stay on top of trends in event design. The jewel tones of our lustrous linen offered in this collection is characterized by the embellished, embroidered, and multi-layered features of the textile. We are always seeking the latest styles and trends in the industry. Call us with your request. Prices vary. Event Exclusive Collection: We offer custom orders or special requests for your event needs. A minimum lead time and quantity restrictions apply. We will work with you to help you find just the right linens for your event and within your budget. Contact us for further information. We have affordable linen rental packages to pair with our chiavari chair rental. When it comes to table linen rentals for your special event in the DC Metro area, trust Eventions Event Designs to meet your needs. We look forward to making your event Event-ceptional!